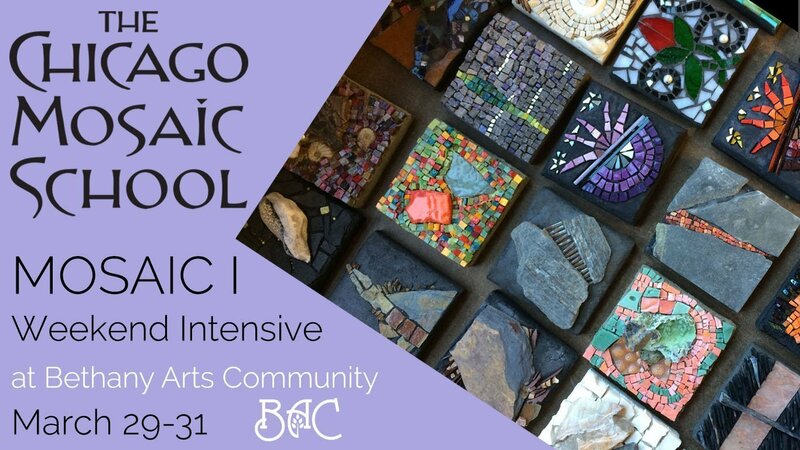 A 2 1/2 day weekend intensive mosaic workshop with The Chicago Mosaic School geared toward the beginner level. Room & Board Students will stay at Bethany Arts Community in comfortable accommodations, in a bucolic, peaceful setting with delicious cuisine served daily. Learn the art of mosaic from The Chicago Mosaic School geared toward the beginner level. No prior experience required. All materials provided. Class limited to 24. 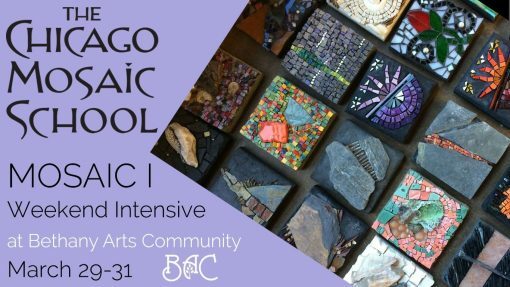 The Chicago Mosaic School signature course in Mosaic Art foundations will be offered for the first time at The Bethany Arts Community. The Chicago Mosaic School is recognized as the center for Mosaic Art education in the United States, a resource for artists and students around the world. In this informative, 2 ½ day weekend workshop is geared towards both beginners and those who may be self-taught and want to learn about basic techniques, tools, applications, and materials. Students gain confidence and receive a solid foundation of new skills and approaches in one full weekend. This workshop covers cutting techniques, proper adhesives, materials, substrates, design/layout and grouting. Students are introduced to both traditional and contemporary techniques, a variety of materials and have the opportunity to complete two projects during the course. Students are encouraged to experiment with color and texture to begin to discover the possibilities of mosaic. Come experience the endless possibilities of this timeless art form. 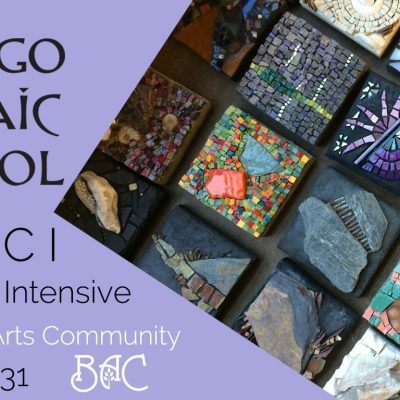 The Chicago Mosaic School is a 501c(3) non-profit organization dedicated to advancing the fine art of mosaics and providing opportunities for comprehensive study with an academic, materially oriented approach to art education. They aim to increase awareness and appreciation for the ancient art form, and create an open community for learning, sharing expertise, and developing the medium within a contemporary context. Curiosity and the motivation to listen and learn are some of the values nurtured at CMS by a treasured mix of faculty, staff and engaged students who create our welcoming and unified community. The Chicago Mosaic School is a space where learning skills and techniques happen through inquiry and collaboration with our outstanding instructors and visiting artists. The school provides an art curriculum for you to build knowledge and approaches to create meaningful work and forge friendships along the way. Since they opened our doors in 2005, CMS has grown into a thriving arts education center and community oriented organization that provides opportunities to individuals and partnerships locally, nationally, and around the world. It is through our unique artists, scholars, and enthusiasts that we have became an important source for energetic and interactive knowledge of mosaic arts. The beauty of discovering visual language and a community to support a creative journey is what The Chicago Mosaic School is all about. We welcome all with open arms.